Christianity vs. Islam: What will be the outcome? Explore the search for peaceful co-existence between Christianity, Islam, and Judaism through the people who are more focused on the character of an individual rather than their religious affiliation in the ‘Two Images of God: Quest’. Is peace between religions something that can be achieved? To explore the possibilities for peace, I’m sitting down with Brian Sheets, to chat about what he found when writing ‘Quest’, the first book in the ‘Two Images of God’ series. Brian, the battle between religions is nothing new, so I’m curious to find out a little more about the spark that initially ignited your interest in this area that lead to this series. In viewing events in the Middle East during the past 25 years, the question arose for me ‘Why can’t we all get along’? Wars in the past had well-defined moral goals of right over wrong or freedom over tyranny. Now, the struggle appears to center around religious doctrine that has been redefined to achieve an end-goal for which there will only be losers. I wanted to write a book that provided a platform for people to explore this question along with me. Looking back over these 25 years, can you tell us about any of events that were personal experiences that helped contribute to this novel. Being a veteran and a student of religion, I felt my life experiences could aid in crafting a storyline that would be of interest to readers. Tell us a little about the was the central point of interest that you were trying to craft. The book series revolves around addressing the question “Why can’t we all get along?” Readers are invited along this journey to explore this question with me. How did you craft and develop your characters to delve deeper into this question and everything it involves? I wanted to develop a list of character that served three purposes. First, they would be easy to identify with. Second, they would represent multiple religions. Third, some would be controversial. There’s always a big risk when working on a project with controversial notes of creating something that may not work. What did you learn during writing to make sure that the book still worked when taking these three points into consideration? A great amount of research went into developing the storyline. This afforded me the opportunity to learn historical details about multiple religions and philosophies. Earlier we touched on the point that ‘Quest’ is the first in the series. Can you give a little taste of you’ve continued to take advantage of these historical details and philosophies in the next chapter of the series? Book 2 in the “Two Images of God” series has recently been completed. “Discontent” was written to parallel the same time period as “Quest” (Book 1). Book 2 reveals how the geopolitical events surrounding the conflict between the Western Alliance and Islamic forces boils over, leading to global chaos. Wrapped in current events involving the historic struggle between Muslims and non-Muslims, the story revolves around two groups and their unique outlook on faith – the mix of feelings they have about their own and how they view the other. As the novel reveals, within both major religious faiths, there exists those who seek peace and those who seek conflict. Do you ever find walking the tightrope of peace versus conflict in your tales exhausting? Or does the challenge keep you energised as you write? I enjoy the research associated with writing and sharing that information with readers. Is this research the key point that you like to hold in your mind when you write? Or do you try and focus on another aspect of what the reader is thinking, or how the story will fit into the series? I generally look at topics of interest and see if a story can be crafted that would be of interest to readers. As you’ve continued to focus on crafting works that would interest readers, do you feel that you have seen a progression in your writing? Initially, I was content writing for a small segment of society. As the years have progressed, I have realized that the market for my writing may be greater than the original small circle I had developed. It is my desire to reach those for whom my writing will be a welcome addition to their life experience. If you had to describe your brand to those who might find your work that welcome addition to their lives, what would you say about it? A characteristic of my brand is an easy-to-read style of writing. I prefer the use of everyday conversational language as opposed to academic-eze to enhance reader enjoyment. Enjoying yourself when you read is essential, and I’m glad to hear that you’re putting effort to make sure readers love your work as much as you do. One way you could up that enjoyment factor is to toss in a few more crazier questions to complement your central question to keep those readers on your toes. I love doing this for a few quick questions in each interview. Let’s try a few out to play around with upping our own enjoyment factor with, why is a square meal served on round plates? That makes a lot of sense when you think about the art of pottery. Okay, let’s try some fun with the art of words. What’s your personal favourite word? Outstanding choice! And here’s a few questions with fewer choices, but you never know they might be interesting. What interesting zodiac sign do you fall under? And, are you left or right-handed? Right on! Well, we’ve spent enough time chatting today, I’m sure you’re keen to return to crafting the next stage in this series, so I’ll let you return to your pen, but before you do can you tempt those pondering the question ‘Why can’t we all get along?’ with a taste of what we can expect when picking up a copy of ‘Quest’. I am stuck in the present, attending to feuds from the past, and not able to apply myself to the future. Brian, thanks for taking us out of the present and showing us a glimpse of time in ‘Quest’ and good luck on ‘Discontent’ and beyond! Excited to read the book we discussed today? Find it here on Amazon: ‘Two Images of God-Quest ( ASIN: B078ZJXP2V )‘. 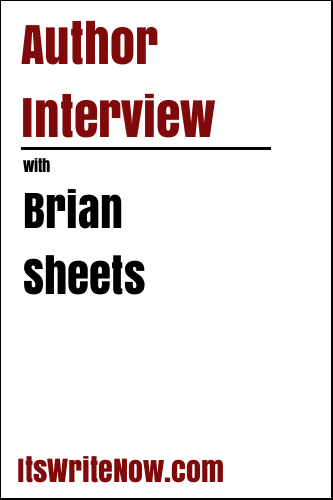 Want to find out more about Brian Sheets? Connect here!